Two more days and the A to Z Challenge begins! Everybody ready for some fun? That’s right – fun. The Challenge is many things, but bottom line, it should be fun. We’ll all visit new blogs, make new friends, stretch ourselves to post according to the alphabet, discipline ourselves with daily blogging – fun! Post daily (except for Sundays) on a topic that matches that day’s letter. We kick off April 1 with A. Have the A to Z Challenge button in your sidebar. Check your link on the list – make sure it goes to your blog! If not, let Jen know so she can correct it. Pre-schedule as many posts as possible to save time. A theme is good, but not necessary! I didn’t have one last year. SHORT POSTS!!! This is for YOUR benefit - most won’t have time to read longer posts. How short? If you’re over 500 words, it’s way too long. Just a suggested guideline. DROP WORD VERIFICATION! Switch to blog owner approval or let the excellent spam filter catch crap. Again, this is for your benefit – word verification will discourage comments and visitors. Also, imbedded comment boxes can be a challenge. Make sure you have the Google Friends Connect widget so others can follow you as well. Visit other participants. Overwhelmed? Select a starting point on the list (please, let’s not all start with #1) and visit twenty a day. Can you do that? Visit the host sites for list access or send me an email and I’ll send you the code for your own blog. Follow blogs that interest you. As you go through the list, you’ll find some cool blogs, and once the Challenge ends, you’ll have a batch of new friends. Don’t stress. Make every effort to post and comment, but don’t let it overwhelm you. I decided to approach this year’s A to Z Challenge with a theme in mind. My blogging buddies have been so awesome this past year, commenting, supporting, and promoting my book, I wanted to give back to awesome people. So, during the month of April (and in addition to snippets about movies, music, tech, and book stuff, and I will keep it short!) I will feature two special blogging buddies each day! I wish I could feature all of you, but I limited it to two special bloggers who might not get the attention they deserve. So, be watching to see who I selected as the letters roll past. Remember, Captain Ninja Alex’s Army rocks! Anyone else going with a theme? Followed all the tips? Feel like quivering Jello? Thanks Alex. I'm gearing up. It's a great challenge and I'm looking forward to it. Bet your first post is on "Alex" LOL. That's so great Alex, featuring other bloggers! I've already found a bunch of great new blogs and the challenge hasn't started yet, so I consider it a success already. I'm really excited! I'm going to try and read minimum 5 in the AM, 2 or 3 at lunch, and 5+ in the evening. Then set aside several hours on Sunday to do nothing but blog hop and read blogs I couldn't get to during the week. li, that's a good plan! What an excellent idea for a theme! I've been going through and visiting many new blogs to follow, and plan on doing a lot more as the month goes on. These are wonderful tips on how to handle the Challenge, esp. the turn off word verif!!!!! I followed your advice. Most of my posts so far aren't longer than 200 words and I kept to the theme of my blog. Can't wait. I'll try to not start with 1 but I'm that kind of person. I don't want to lose track. What a great idea. And thanks for mentioning that word verification drop. Wish everyone would get rid of those. That's a hell of a good theme. In what form should bribes be sent in order to garner favour for special blogger position? Hehe. I've not a clue what theme to choose this year. I'll likely just talk about whatever pops into my head that day, but you're right that having a coherent thread to link it together would be pretty cool. Can't wait for the challenge, it's gonna be awesome!! I love forward to the fun! I have to say, I really hate it when blog comments have to be approved. It makes me very reluctant to comment again in the future. Especially when the blogger doesn't get around to approving them until hell freezes over. I like the theme idea, and I've already started planning what each letter will be. Not sure what I'll use for X, but it should be interesting. I also like the idea of visiting 20 blogs each day. I'm way, way, way down on the list, so hopefully you all will come visit me at some point! I'm so glad that I stumbled onto your site, Alex! Oh, and I got rid off the "WORD VERIFICATION" thing a month ago. It's completely unnecessary! Have a glass of wine and some chocolate and enjoy!! Eep! 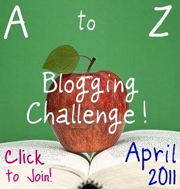 I'm quivering in Jello just thinking about the A to Z challenge! I've never done it ... the thought alone overwhelms me. I do, however, have made respect for those who do it and complete it! Go Alex!!! I never could have done it if it weren't for your tips and support, Alex, so thanks so much. What a lovely way to give back, by featuring other blogs as your theme. I think I'm ready...we'll see. I'm doing several vlogs during the month, but otherwise I don't really have a theme exactly. I've also decided that among my 15-20 blogs a day I'm going to feature a handful of them with each post so I can make it easier for my readers to find new blogs without going through the whole list if they aren't participating. Can't wait! There are several letters I had a hard time deciding because I had so many good ideas! How nice of you to highlight other bloggers. I'm keyed up and ready to go with the challenge. Except for K, that ones proving difficult. But I'll figure something out. thanks for the tips, started cassastar this week. I am enjoying it. first of all...thank you for ALL THE WORK you and the other santa's helpers have done in giving us bloggers and miscreants these wonderful gifts. i'm taking your's and the others helpful suggestions to heart. i write lengthy posts as a rule but will have them all shortened to 500words or less. one thing that caught my attention this morning was the suggestion for "NOT ALL to start at the beginning of the list and work to the end." for sure i will start at the end of the challenge list and work,read and comment my way back. as a rule, i don't leave comments if i can't understand or relate to a post nor do i like leaving off the cuff comments. I thought about doing a theme but chickened out! I thought I might get bored! I'm looking forward to this. I really need this. I've been in a blogging slump! I don't really have a theme- My theme is kind of the letter of the day LOL But I have preposts ready- I've already followed a few other bloggers doing the challenge and I can't wait to start! I'm looking forward to it. I've already got A-C planned and partly written. I have another for G, not yet written, but planned. It'll be fun and it makes me think harder on blog post subjects. These are all very reasonable suggestions. I hope people are listening and acting accordingly. I'm glad you're doing the blogging buddy feature thing. I was doing some similar things last year, but I haven't planned much of this for the upcoming challenge. Looks like you've got a good plan in place. Hi Alex .. great advice .. 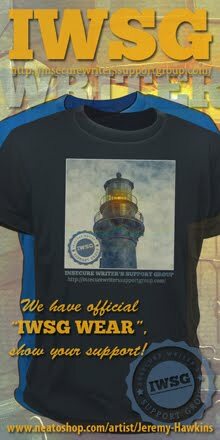 I must make a couple of changes I see .. but I'll definitely be visiting as many blogs as pos .. I'm starting at 223 ..
Well, everyone should drop word verification, regardless of if they are participating or not. Great idea to feature bloggers who may not have the exposure others have! What a community this is. So many good ideas that we can use and build on for next year. Two more days ... let the Challenge begin! I agree about word verification. I've never used it. Now bring on the challenge !! A theme sounds like a great idea. I'm still on the fence for signing up, but it does sound fun. Laura, wherever you begin is fine. Jamie, no bribes needed! And you still have a day to think of a theme. Sarah, but it is one step less than WV. Bz, whatever works! You can also have messages emailed to you as well. Kris, I'll visit you soon, as I plan to start past the halfway point. Justine, you can do it. Sommer, too many ideas is better than none! a sojourner, you are welcome! And I like the idea of working backwards. Jennee, I survived last year without a theme. Patricia, you can do it! Hilary, I like that number. Cheeseboy - do it, do it!! Jeffrey, rockin' as in music??? I've done all I can do for the fest, so roll on Friday so I can enjoy the challenge. You are awesome! Can you send me a link for my blog?? I'm especially retarded when it comes to links. This is brilliant and I have some of my posts ready! yay! They are very short and sweet. Good tips sir; looking forward to it. My theme: short story markets to submit your work, from A to Z! Have every letter loaded but W.
Nutschell, I'm sure you'll figure it out! Milo, I like that theme. Fun!!! (= Perhaps I'll join in. Can't wait! And I'm glad you mentioned about the SUNDAY thing. I wasn't sure how the 26 days worked. Bunch of great stuff Alex. I know will have to skip reading many of the comments on the blogs I visit or I'll never hit 20 a day. Unless you have some super secret way to do both! Clarissa, Sundays off for good behavior. The first two I swear by...most of the time. I didn't come up with a theme. Maybe next year. Your idea is great. Counting down. I've got three themes that I may just weave together. Can't wait to see experience everyone's creativity! That's a great way to do it, and very gracous of you. I'm going with a childlike theme. I'm stressed AND looking forward to it! Thanks for the advice, Alex. I'm going the writing-prompt route, and inviting readers to throw words at me . I'll let one of the words grab me, and write what it tells me to. This will limit pre-writing, I know, but I'm hoping some of the suggestions would for letters like M or V, so I can prepare them in advance. I've never blogged everyday before, so my blog's name-Daily (W)rite-will take on a new meaning! I hope some of the other participators will throw in words too! Robyn, I'm sure your posts will be fun! Damyantiwrites, I bet you'll come up with some good stuff that way. You have really planned this out, Alex. Are you naturally an organized person? Hope you have fun during this challenge! I think everyon should start at the person AFTER them and go from there... that way we all have different starting spots... or that's my plan anyway. LOVE your idea to pay it forward! I think most of these tips work for blogging and blogfests in general - great set, Alex! Thanks for this, Alex! I have been wanting to participate, but thought there's NO WAY I could visit 800 different blogs per day, especially with my book launch on Monday. But your idea of taking 20 a day seems doable. If I take 30, I could probably even get to all of the participants once. That would be a good introduction, at least! Hart, such a brilliant idea! Teresa, that's a good theme! My writing was influenced by Star Wars. India, sign up - especially since your book comes out Monday! Wooooo! Can't wait until tomorrow - we're going to kick it! Yes. This is going to be fun. I like your theme. Mine is travel as am posting on L'Aussie Travel. Never boring that way! Biggest challenge is when to post. It's been April 1 here for 7 hours but I guess I post American time so not til 9pm Australian time. I definitely don't have a theme, but I've already picked most of my topics. I'm ready for this thing to just start already! Denise, that's a good question. I guess those in your area should post late and our area should post really early. I have my first post for tomorrow in the challenge from A to Z. My first title will be "Aubade. " Greetings. Alex, I'm looking forward to seeing everyone's posts! A big thank you for suggesting that word verification be kicked to the curb. Good luck with the challenge. Hi Alex, you are such a familiar name. You and Lee and the rest are fantastic hosts. Thanks so much for the tips. We have a head start here in the Far East, so mine was up about six hours ago. Hope you can drop by sometime. I'm gonna lose it!!!!!!!!! I'm so excited about the release of year TWO in the ring of A to Z blogging! Nothing beats a team of awesome!! Woohoo!!! (I'm kind of hyped up on chocolate... it happens). Leovi, I'm sure every post will be amazing! Jen, we'll peel you off the ceiling when it's over! Great theme, Alex! I'm looking forward to the challenge. Okay, I've got my first post pre-scheduled. Hahahahaha... arggggh. Lynda, not Twitter short I hope! Dani, you'll have a blast - promise! I know I already commented once on this post, but I'm starting my official commenting to the A-Z Challenge and you're third on the list, Alex! Good luck and have fun with it! Anyway. How cool of you to feature bloggers! Sounds like a great plan~ Looking forward to it! Congrats on the HUGENORMOUS turn out Alex- will be cheering you guys on from the sidelines! Thanks for the handy pointers Alex, I suspect our A to Z trip is going to be an exciting, fun challenge. Heres one to fascinate our blogging hive minds, Mr Atoz's Trek Challenge. Yeah, I know. I've been watching too much Star Trek. It is going to take a day just to read the comments! I love it! How wonderfully exciting is this! Greetings from OZ Alex, delighted to be here. You are my first stop on the hop, please enjoy my A post. Not hard to guess it's A for Australia. Enjoy. Nice post, I dropped the word verification like you suggested! Jeffrey, wait - come back! Ella, go forth and conquer! Hey Bru! I hope to visit you at least once this month. Spacerguy, nothing wrong with that!